Judge Brett Kavanaugh, President Trump’s nominee to the Supreme Court, visits senators ahead of confirmation hearings. Justice Anthony Kennedy, age 81, announced he would retire on July 31, kicking off an all-out partisan battle in the U.S. Senate over the future of the Supreme Court. Kennedy, a Supreme Court justice since 1988, was often the “swing vote” in many 5–4 decisions—sometimes siding with the more liberal justices, and other times with the Court’s conservative wing. 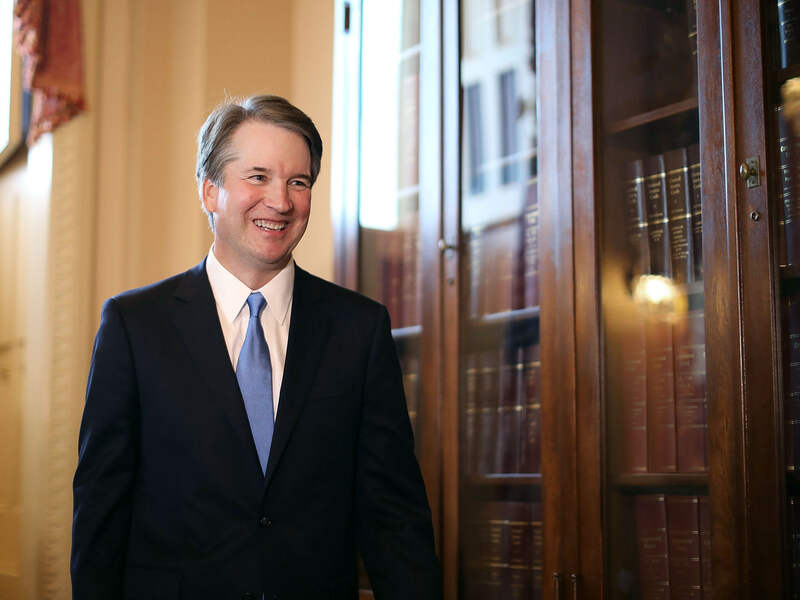 President Donald Trump’s nomination of Judge Brett Kavanaugh to replace Kennedy has set the stage for a hotly contested confirmation process in the Senate. Kavanaugh is the second Supreme Court nomination made by Trump in less than two years as president. Neil Gorsuch was previously confirmed in 2017 to fill the vacancy created by Antonin Scalia’s death in February 2016. President Trump again relied on a list of potential nominees supplied by the Federalist Society, a conservative legal organization. Kavanaugh has served as a U.S. Appeals Court judge for 12 years. Originally picked to be a federal judge by President George W. Bush, he is a graduate of Yale University and Yale Law School. The Constitution requires that federal judges be approved by the advice and consent of the Senate. Because of recent changes in Senate procedures, a simple majority is all that is needed for confirmation. The Republican majority is thin: 51 to 49. But Arizona senator John McCain has been absent from Senate proceedings for months due to a grave illness. Senator McCain’s health could affect Kavanaugh’s chances. The confirmation fight will center around key senators on both sides of the aisle: moderate Republicans Susan Collins of Maine and Lisa Murkowski of Alaska, and Democrats seeking reelection in states such as Indiana, North Dakota, and West Virginia that Trump won in the 2016 presidential election. Senate Majority Leader Mitch McConnell aims to hold a confirmation vote before the Supreme Court’s October session begins. Democrats hope to either defeat the nominee or prolong the process until after the midterm elections. The battle over Kavanaugh is sure to have an effect on voter turnout in November. Coverage of President Trump’s nomination of Brett Kavanaugh to replace retiring Anthony Kennedy on the Supreme Court; includes videos of the president’s announcement and a brief address by the nominee. This newspaper editorial provides background to the Supreme Court confirmation process and carefully weighs the stakes of Kavanaugh’s confirmation, without making an explicit endorsement. The US Supreme Court: Who Are the Justices? This webpage provides short sketches of the sitting U.S. Supreme Court justices, including Justice Kavanaugh. This educational activity explores how the federal judicial nomination process works; includes constitutional context, judges’ biographies, and more. Website of the organization responsible for providing President Trump a list of potential nominees for the federal courts. A short video that compares and contrasts the “schools” of constitutional interpretation—“living” Constitution versus originalism.